We are now taking orders for November 2019! First, you'll need to decide on a flavour. Our most popular wedding cake flavors are Whittaker's Dark Chocolate Gateau, Chocolate Gateau, Red Velvet Gateau, Salted Caramel, Black Forrest Gateau and White Chocolate Gateau. Our bespoke cakes are one of a kind, so feel free to suggest your dream flavour, any dietary requirements and we are happy to make it. Your choice of cake flavour has no impact on price so feel free to indulge! Next you'll need to decide on the size of your cake. Are you after a specific number of tiers? Do you have an idea of how many servings you'd like? Would you like to keep the top tier for yourselves? Do you prefer the standard 3" tall cake or the trendier 6" tall cake? Check out this size guide or give us a call to talk about sizes. Do you prefer buttercream to fondant? Something modern or traditional? Cakes covered in fresh flowers are stunning, and can be used to tie into a specific color scheme. Customized cake toppers can provide that personalized finish to your perfect cake. Meringues and macaroons and fresh fruit such as figs and berries are fantastic on cakes if you are after that modern ‘Pinterest’ look. They also lend themselves well for gluten free cakes. So you’re getting married, how exciting! Tall buttercream cakes with fresh flowers, macaroons and fresh figs are favorites this season. For the more edgy couple, strong geometric (architecture inspired) fondant cakes and hand painted details will suit. Naked cakes continue to be a favorite for the 2018 season. Our cake prices depend on the number of tiers, diameter, height of the cake as well as the complexity of the design and the price of any toppers. Most cakes range from $350 to $850. 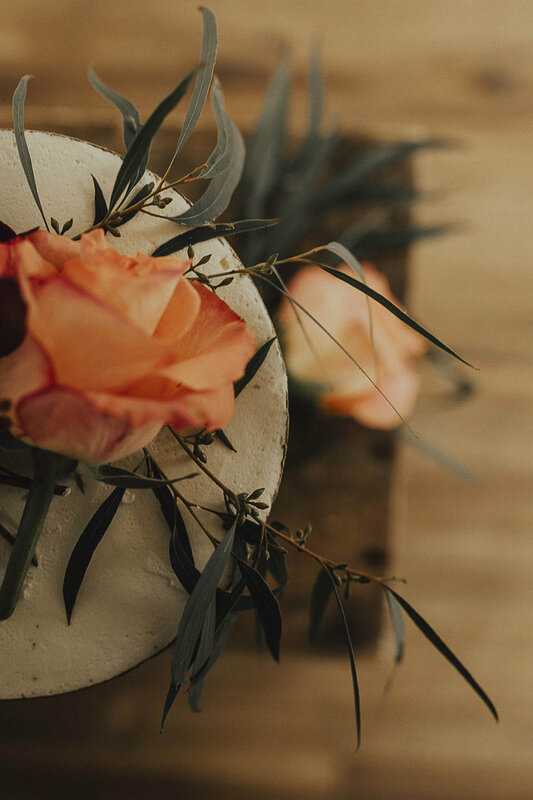 We understand that most couples have a set budget for their wedding, we are happy to have a chat with you to help design the perfect cake to your budget. We like to get to know our couples, your likes and dislikes, so that we can design the dream cake. We offer a $30 cake consultation service which includes cake tasting for two. If you decide to book your cake with us, your money goes towards your cake!